I am struck by how many of the Eurasian "weeds" are edible as spring greens -- and then i'm not. We've preserved our folk knowledge of survival skills in herbals over the past five hundred years. The pre-refrigeration, pre-canning desperation for fresh food after a long winter must have meant that there were hundreds of years of experimentation available for reference. "Yeah, we ate that last year and no one died." After reading up on henbit yesterday, i now have four rules for foraging unidentified plants. 1. If it's in the Mustard family, edible. 3. If it's a seaweed, edible. Henbit is an edible mint that doesn't smell minty, by the way. All the plants i found yesterday were Eurasian, and so far only one, groundsel, is not edible. Christine has had a rotten day, and her mood has been hard for me to escape. Dinner was a stew, which burnt in the pressure cooker, and i think she's called it a day. I took a walk between downpours and sprinkles and collected a bunch of "weeds." It turns out Bermuda Buttercup, (Oxalidaceae) Oxalis pes-caprae, is a rare plant in South Africa. It's a hugely successful weed here. I took some photos of the pistil and stamens and noted curious structures. 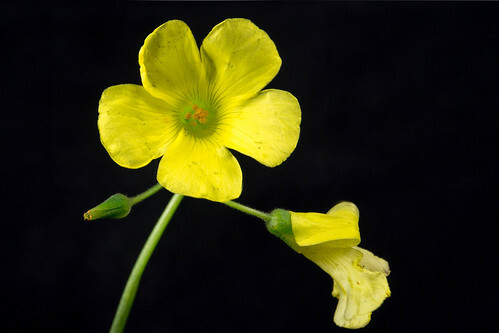 An image search turns up all sorts of discussions about the pistil and stamens due to the curious reproductive choices of the Oxalis plants: despite having both male and female structures, they cannot self pollinate. There are three different arrangements and cross pollination occurs with a morph of a different arrangement. Apparently it was very rare for the California plants to set seed -- i assume this is because the populations of morphs were not balanced. It turns out there's an article looking at this question in respect to the invasive populations in the Mediterranean. Also, in more Plants are REALLY WEIRD commentary, not only do the morphs not self pollinate, but one morph has FIVE sets of chromosomes while another has THREE. We're more closely related to slime molds and fungi than we are to plants. 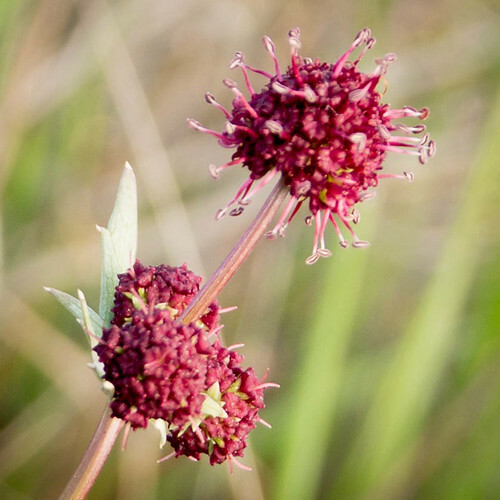 So, we now have a mystery: why is a plant that can't set seed invasive? Apparently the little bulbs it set are very successful. I read "CLASP-mediated cortical microtubule organization guides PIN polarization axis" and recognize i have a long way to go in the botany comprehension space. Huzzah! I can now read posts with phrases like "GPT2,a glucose 6-phosphate/phosphate translocator, plays an important role in environmental sensing in mature leaves of Arabidopsis thaliana.... the partitioning of glucose 6-phosphate, or related metabolites, between the cytosol and the plastid modulates these developmental responses." almost like it's English! It's worth marking an uptick in comprehension. Greycie Loo woke me early this morning. It was not outrageously early, and as i let my mind drift, i landed on creative and useful things to do with the time. Before i started, though, i sent my siblings a rave email about Anki and recommended that it would be good for their kids. My brother was awake in Seoul, realized i was awake and called. We chatted for a long while about the situation with my parents. Both my sister and i have talked with my Dad and we're willing to hold off on significant interventions until after my dad tries his plans. I wasn't planning on waking to heaviness. I did have a pleasant time before he called working on new flash cards. When i first got Anki, i realized i could make botanical cards not just for myself but to share with others. Since starting, i've found much better ways to phrase questions and use the flexibility of the system: my original botanical cards are not well structured. I started making new botanical cards and started making my own diagrams, too. I'm fairly happy with how they were working out. This morning i set aside an hour to work on my Yam. This yam is barely out of the oven, not a cold congealed thing, but if i can avoid procrastinating that would be great. Having a fresh hour to work on it was very good. I will keep trying -- but i see early meetings getting on my calendar again. Maybe it was summer break with the Europeans on vacation. ... i am playing iOS game "Swords and Sworcery" as i rest. I enjoyed it at the beginning, but the coordination to fight off the trigon's lightning bolt attack is annoying me. The training mode is civilized. So far I'm not feeling stressed but as soon as that happens, i'll start ignoring the game again. I think i got the game in some "free this week" offer in the IOS store. I'm not much of a game player, but we'll see if this pulls me in. ... i read Schild's Ladder by Greg Egan on Overdrive on Saturday. I did not take the time to pay attention to the science fiction unification of gravity and quantum mechanics with my critical mind, but let the the device move forward. I found the layers of world (and universe) building and narrative nicely interwoven. Having been thinking about biochemistry since starting the Great Courses Biology: The Science of Life by Stephen Nowicki, i appreciated the effort to evolve a novel form of life. I just have an itchy feeling the writer got to a point and some one said "Wrap it up" and a chunk of discovery, explication, and resolution was skipped to, well, wrap it up. On the other hand, sick reader. ... i finished Coursera's Learning How to Learn. It reinforced some things i had picked up over the past decade: oh, if i had learned these things BEFORE grad school! The newest point was that exercise is also useful for learning. ... i started Coursera's Preparation for Introductory Biology: DNA to Organisms. I decided i am not interested in participating in the peer engagement part. Since my goal is understanding plants at the ecological level, i try to keep my focus on the keys details for that. One of the TA's helped me find a text that explained relative densities of ions in solution in plant cells to contrast with the human bias presented in the lecture. I suppose many people taking biology are en route to the medical profession. Hrmph. In exciting genealogy news, i've been contacted by relatives on my Swedish great-grandfather's side from Sweden. His history, prior to getting married, is not well documented and there is little in our family records. My earliest documentation had been a census record after the first children were born: no idea when he was married, immigrated, etc. I spent some time on google earth translating his mother's and father's moving about from the email narrative to a map. It was a little while before i realized that the movement from HOUSE TO HOUSE was being passed on, all within no more than 5 miles square. From that history, to crossing the Atlantic, moving around the eastern seaboard, to Wyoming, to Florida -- what a change! * Coughing when i sit up and talk for a while. Saw the doctor yesterday and was told keep resting. * Family dynamics are in a holding pattern. I'm still looking for resources and have no idea how fast this needs to move -- but right now we're letting my Dad call the shots. * Haven't heard from HR about the resources for my staff member. * Christine's therapist was even less impressed with the psychiatrist's behavior because the three word "diagnosis" was first just sent to the therapist and then sent to Christine with therapist cc'd. Therapist has disabused Christine of the notion that it is a reasonable "diagnosis." The previous night's (American) murder mystery tossed the same diagnosis around for the suspect. On the other hand, what a delight is the internet to an independent scholar! JStor is opening up a little bit, there is also Christine's discovery of DeepDyve. Admittedly, the paper that changed the scientific name from Linnaeus' name in 1973 is over $40. And it does nothing to change my opinion of the commercial scientific publishing industry to see that the paper is owned by Springer-Verlag. What would a voodoo doll of a corporation look like? Christine says this is the CEO's purpose. The essay still needs some work on describing the images, and then a conclusion. I'm thinking of putting it in iBook form, and wrapping up my Borage iBook. I'm also thinking of contributing the work as a "treehouse" in the Tree of Life web project. Maybe again in Medium, too. The topic i forgot yesterday had to do with the block of Pu-ehr tea. I think it was a purely ornamental block: poking into it revealed no highly compressed leaves but a greyish powder. Well, i didn't let it get stale, i guess. I've a thistle to photograph today. I read The Oldest Living Things in the World by Rachel Sussman yesterday, quitting work early.No insomnia was involved: Amazon's 2:47 am delivery was their commitment to have it in my email box between midnight and 3 am. I enjoyed reading it, and file it in my mind as another model of book i could write. I felt my photographic skills were reasonably validated, although i recognize she's using significantly more complicated film and formats. It's tempting to consider medium format photography, but i think i can be comfortable living between the extreme of professional kit and consumer tools. So, how to keep moving on? Christine has already been trampled byElephants this morning. I'm feeling steady, leading me to believe that a week ago i was, indeed, under the weather. It's so hard not to project. I know what spiral my thoughts would be in if i were her: but we are not shaped by the same deep chthonic forces. Empathy needs then to be able to project and yet not over project. I shared with my sister earlier this week that Elephant Wrangling on Christine's part is part of The Solution, the process by which we free ourselves from dependence on my salaried position. Elephant wrangling tools are accessible to us right now, and she's making good use of them. I know i had begun to feel trapped again, pinned against my career, but reminding myself that this work is just as much a part of The Solution as is learning biology has helped me recognize our forward progress. Meeting this week hasn't helped. I ignited a great deal of consternation that has not been settled, and flared again this week. I will spend time discerning today. I spent much of yesterday failing to identify an asteraceae that i have documented in excruciating detail - except for how the leaves grow away from the blossoms on most of the plant. 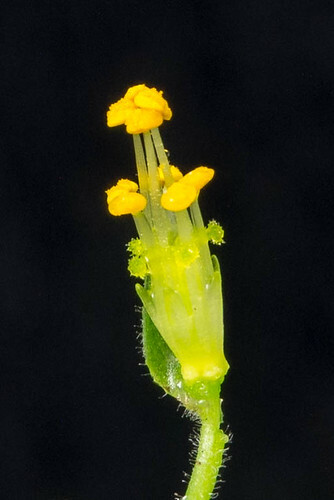 There are some features that are extremely obvious: glands on stem, leaves and the green cup at the base of the flower (the involucure). The strong aromatic scent. The parts that make up that green cup (phyllaries) have a golden, translucent papery edge to them (scarious). I feel i have really good images to answer almost all diagnostic questions, just missing the way the leaves behave all over the plant and any root questions. Fie! I'm hoping it's a landscaping plant that has just gotten out of control in this one spot. I have demonstrated to myself that the way i had been taking macro images may have had a deep field of focus, but the image was "soft." I've found out how to adjust the f stop on the camera when i'm using tubes (jam piece of paper into the little mechanical lever), and now, with a more shallow depth of field, i need to use focus stacking to get the depth i want. No focus stacking here as the image is in the plane of focus. I had meeting responsibilities as well as a concert in the evening. I was home late for me and stayed up even later to watch Fargo the TV series with Christine. I've happily sold the liner of Christine's motorcycle jacket on eBay for more than just shipping; my goal next is to try some old tech tools. If they don't go on eBay, i'm certain they'll go locally on Freecycle. I'm trying not to get myself in a rant over how the painters carelessly moved my plants around on the deck. I'm not sure if we had warning. If we did, perhaps Christine tried to protect me (as i was exhausted and unwell earlier in the week). She said she had let them know she could move things and they told her they could handle it -- and they stacked plants on top of plants on top of plants. I've read the internet this morning, reveling in various botanical and ecological content, tweeting and plusing away. Yesterday work started very early after a long evening of things going wrong with an install. So i quit at the end of the east coast day, tried to nap, and then pushed Christine out the door to go to a native plant nursery. The nursery was "over the hill" on the way to Half Moon Bay, and the "need gas" warning came on as we drove there. Since i didn't want to be delayed to when the nursery closed, we decided to get gas in Half Moon Bay (surprisingly, not marked up beyond belief). Since it was 5 pm-ish (and, gee, won't the traffic home be miserable) we went for dinner at Ketch Joanne. I think of it as a reasonable hole-in-the-wall with delicious food, but the bill was more than a tank of gas -- and provokes a great deal of budgetary pondering on my part. Then we took a tiny walk on a harbor beach, and i found in the very limited wrack line a nice diversity of seaweeds. On the way home we pulled over so i could pick some lupines from the roadside. Thief, thief! So i better go photograph them before they fade. Had energy enough to get to 4 pm on Tuesday, then, despite coffee, felt all the wind leave my sails. Wednesday i put in a day and a half. In meeting on Sunday i meditated on a number of things, one of which is a certain type of certainty i am feeling right now. It's a certainty that i don't always have, and missed for years. I have no idea where focussing on botany and photography will take me. It's possible it will simply soothe my heart and mind through the end of my career in software development management. The other was about diversity: people, practices, plants, critters. There is a diversity of reasons for valuing diversity, but i also was thinking about the reaction i had to a biologists talking about the high amount of order in life. Diversity doesn't immediately come to my mind as order -- and i realize that there's probably a Western/scientific bias to that view. We have a flawed premise, i think, about efficiency and a type of order that's like the lattice in a crystal. Diversity is efficient in the holistic view, but the holistic view is something that is so hard (it seems to me) for our culture. We tend to optimize on one dimension, think of a field of corn planted in Idaho or a group of Quakers all with the same theological understanding and practice (just shy of a creed). There may be efficiency in one output (bushels of grain, coming to decisions and communication), but both are expensive to maintain and fraught with long term instabilities. In a holistic view, i think we are (re)learning that a diversity of corn genetics and a diversity of land uses may have lower yield, but is sustainable and resistant to a variety of challenges. Similarly, groups of people who have only practiced all being in accord are likely to schism when a truly challenging decision must be made. Will global warming teach us to think more holistically, include more factors, more time, more change in our decision making? I need to be more active in the evenings. I had picked up for a while. Much pondering this morning, little writing. Woke far too early this morning, worrying about work things (mainly an ongoing failure to complete responsibilities to my staff). Reading through folks lives, i remember there are other issues that deserve care and Light. I hold up my fallibility, our human fragility, our broken hearts and remind myself of the four gifts i rely upon: grace, courage, support and wisdom. May we all experience the grace and support we need, and be supplied with the courage and wisdom to move through our day providing grace and support to others. I did have a happy discovery when reading my RSS feeds yesterday. Stanford's art museum, the Cantor, is sponsoring a landscape photography workshop at Jasper Ridge, an area with fairly controlled access. It's just $10. It will be on the summer solstice, so in this dry year there may not be that much in bloom, and i'm no grass expert. 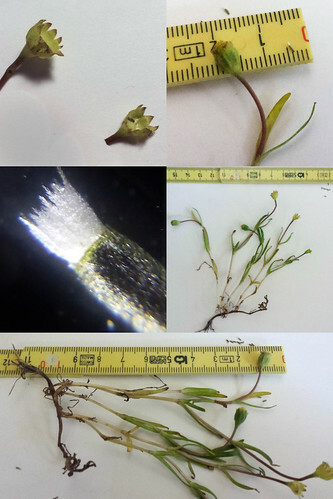 I will, however, try to remember what the images are that one needs in identifying grasses before i go. The sun is now high enough in the sky that the redwood to the south no longer shades our deck. We put grommets in the sun blinds, and we can now use bungees to attach the shade to the railing. The awning then makes the deck a more comfortable living room. I do need to get some watering done. Yesterday was a little more intense and social than i had planned, but it was good. I visited with photographer Joe Decker and brainstormed and chatted about what's next for my photography. I think i have some clarity about activities that will be distractions and activities that are valuable. Distractions aren't bad, per se, but if i'm confusing the activity with progress on The Solution, it's a problem. I'm not going to play with photos and botany this morning, i told myself, i'm going to go straight into the Meeting work i've set aside for too long. 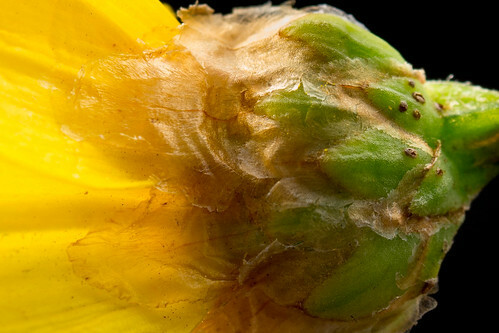 But when i opened my laptop, there was the evening primrose photo i took late Monday afternoon, a careful slice down the side so i could peel the petals around and expose the structure of the pollen bearing bits (anthers and stamens) and the seed creating bits (stigma, style). "Look at how the evening primrose gets it on," i'd said to Christine (who'd responded with a perplexed look). "Wild partier!" I've not posted the photo yet out of disappointment. I identified the flower a few years ago when i most likely to do a search: What evening primrose live in Santa Clara county? That's not a bad way to go about it, but it's not the scientific way. And i've been "bit" by the variability of some flowers and the failure for one photo to sum up the characteristics that distinguish plant a from cousin plant b. So, looked at the key and found the key features were the measures of particular parts and the seeds. Data i don't have on me. In writing this and reading the key, i'm a little more convinced that my ID is not far off base. So here's my photo. Maybe tonight i'll make progress on the Meeting responsibilities. I've seven six workdays before i immerse myself in seaweeds. Let's hope that is a figurative action, as i am already pondering how clumsy i can be, and the clambering needed for the collecting. Letters this morning to photographers. First is someone whom i paid for an hour of consulting in 2011. Next is to a photographer i will see at the seaweed workshop. I am amazed at how long it's been since you published your composition book. The years just slipped by (and the depression was pretty dark for a while). I will understand if this work has been written off as unclaimed, but i think i am finally ready for a photo review. What i'd like is first your impression of whether i over-use any compositional or processing construct and miss using another. I struggle with near-far and know i need to get that skill (conscious attempt thwarted by lens flare and the fact i didn't have grad filter to allow more sky: https://www.flickr.com/photos/elainegreycats/13384937425/ ), and i've bought a set of (probably too cheap) grad filters to improve dynamic range. The other question is what's next in developing myself as a photographer? In mid May i'm going to study seaweed in a Jepson herbarium (Berkeley) workshop: this is investing in my naturalist side. I almost contributed to a Yosemite contest which led to one round of photo printing. I see you and many other professional photographers making a living with sidelines of teaching: i know when i leave software development i will want to focus more on naturalist sidelines (documenting different species, guides to flora, etc). But what does one do past posting to Flickr? Are contests next? Is Viewbug a scam? (I'm pretty sure it is just farming photographers for advertising.) Should i be networking in social media? Going to classes or workshops? Trying to find stock photo outlets? Selling notecards and iPhone skins? Getting together for coffee or via a skype/google chat will be just fine, if the offer for a photo review is still on. I'm a reader of your recent seaweed book and will be at the seaweed workshop at Point Arena, too. I was wondering if you might have time to talk about how you got into publishing your photos as books and provide some advice to me over one of our meals during the workshop. If you have the time, you can check out a sample of my writing in a casual style and my photography at the following links. Also, do you have any interest in carpooling? I am planning to leave just after morning rush hour (or maybe before) on Thursday so as to have time exploring the coast around Point Arena (more wildflowers than wet things). I haven't checked iNaturalist or Calflora for particular blooming hotspots yet, but my travel notes are accumulating at https://www.evernote.com/shard/s6/sh/bd5e7652-3e91-4218-b4be-8650aa2d9168/de5dbfb792f1a995311a9302ef172994 I'm planning on returning the same route, although taking 1 back is very very tempting. I think i found a new time sink that really should be avoided. It's a site named viewbug, and i feel like it is all about pulling mostly ambitious amateur photographers in and farming them. The contests are by folks selling to photographers, and you have to pay to submit to some contests and pay to get lots of features and access most contests. There's tons of "social" interactivity - liking, awarding, favoriting, commenting -- i've transferred a bunch of images from Flickr with the free two weeks of "premium" and am trying not to get sucked in. Does this meet any of my goals? I don't think so. 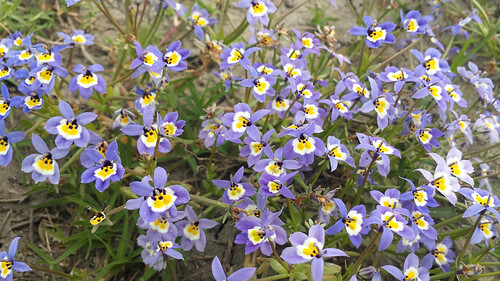 I'm hoping that between the post-visit relaxation, a hormonal shift, and giving in to my naturalist self (writing the essay on Forget-me-nots and the Edgewood trip) i can now return to everything about which i have been procrastinating. None of it is particularly onerous, but i think i wanted to do something for my naturalist future so much that holding off from that to do other things was tying me in knots. annie_r asks, " What is the bioblitz? did I miss something?" To which i must admit only a mind reader had a chance of knowing what i was talking about. National Geographic sponsors a bioblitz once a year, this year in the Golden Gate Recreation Area. Wonderful chance for that networking, etc. But i'd rather go to table mountain (Flickr images). And it seems registration for the bioblitz is closed, so i may have been disappointed had i decided otherwise. This morning a 500 mm reflector lens is up for bid at a starting price of $1. I bid so that the sum of the shipping and price would be $100 and beat the other two bidders, driving the price up to $2 something. I do not at all expect to win this lens as they usually go for $500+. However, maybe the "acceptable" condition instead of "good" will chase away the high price bidders. I recently read an article about how many visible issues with lenses have little to no effect on the quality of the images, so i'm happy to keep my fingers crossed. A reflector lens has mirrors, so it can be dramatically lighter than many other similar telephotos and it doesn't have the chromatic aberrations. Apparently contrast is not as good. The main complaint seems to be the donut bokeh, where the out of focus points of light become rings instead of circular disks. This thread has an example of donut bokeh behind a sparrow -- my goodness what a beak on that sparrow!